This hike boasts some of Slovenia's most incredible views. It’s easy to assume that Lake Bled is simply a photoshopped figment of an artist’s imagination. Upon arriving in this small, unassuming Slovenian town, visitors often discover that it is even more magical than it looks. Its allure comes from the iconic image of a church on a small island in the center of the lake, surrounded on all sides by mountains and forests. Located on the outskirts of the famed Triglav National Park, Lake Bled is a perfect weekend getaway for visitors to Slovenia. 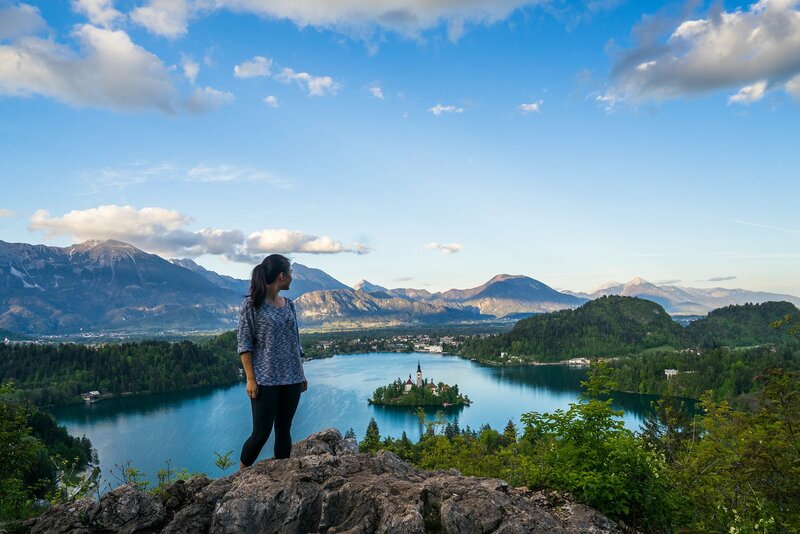 To catch a quintessential view of Lake Bled (for that postcard-worthy Instagram post), the Ojstrica viewpoint hike will take you to the most beautiful Lake Bled viewpoint. This stunning lookout offers sweeping views of the lake, the world-famous church, Bled Castle, and the Alps. It’s a “bucket list” hike that you should not miss while traveling in Slovenia. Difficulty: The Ojstrica hike is completely uphill, with easy to moderate difficulty. When to go: Sunrise and sunset offer the best views of Lake Bled. Go up early to beat the crowds and secure the best viewing seat. Beware of hiking in the rain, as the pathway can get muddy and slippery. How long it takes: Since you need to walk from the town of Bled to the hiking trail, the round trip will take anywhere from 1.5-2 hours. Costs: Hiking to Ojstrica viewpoint is free. Walk from your hotel to the paved pathway that circles around the banks of the lake. From there, walk counter-clockwise toward Camping Bled, which is located on the opposite side of the lake from the town’s center. The walk there has many beautiful spots to admire the famous church, up-close and personal. On the way to the trail, you’ll pass a tennis club and a small pier. After the tennis club, you’ll approach Camping Bled. You can’t miss it – there are several tents, a trampoline, and a rocky beach. Once you pass the campsite on your right-hand side, you’ll hit a wooded area with a nondescript sign that says “Ojstrica” and “Osojnica” (pictured above). This trail may look a bit sketchy leading directly into the woods, but rest assured that if you see the sign, you are in the correct place and will be at the Ojstrica viewpoint soon. Once you’ve gotten on the trail, it takes 20-40 minutes to reach the top. The trail is fairly straightforward, with a dirt path weaving through the forest. About 15-25 minutes up, you’ll see a sign that separates Ojstrica (the lower viewpoint) and Mala Osojnica (the upper one). Turn right at this sign and follow the path a few more minutes, and you’ll arrive at the Ojstrica viewpoint. You will notice the path starts to get fairly steep, with a few rocky switchbacks. After a few minutes on this part of the path, the trees will part slightly and you will arrive at the viewpoint. At the top, there’s a bench to sit on, as well as several photo-worthy rock lookouts. Ojstrica is a fantastic place to relax, eat a snack, and watch the sunrise or sunset. If you have more time, it’s worth continuing up to the higher point, Mala Osojnica, for an even better Lake Bled viewpoint. If you have the time, it’s worth trying out both hikes. I hiked this trail alone – as a solo female traveler – and felt completely safe. It’s not very well lit at night so be sure to bring some kind of lighting if you’re hiking in the dark. I ever go abroad without travel insurance – it’s always nice to have the peace of mind of a backup plan for any emergencies. At Jetfarer, we recommend World Nomads – through medical emergencies and flight cancellations, they’ve always had our back. Hi! Was this photo taken at the lower or higher viewpoint? and what time was this? Thank you!